Indian Embroidery – These things called "Words"
Embroidery, the art of working raised designs in threads of silk, cotton, gold or silver upon the surface of woven cloth with the help of a needle, has been known in India from very early times. Gujarat and Rajasthan boast of a mind-boggling range in embroideries. Kantha of Bengal, zardosi of Delhi, kasuti of Karnataka, phulkari of Punjab, the gold thread embroidery and gota work of Rajasthan, the zari work of Hyderabad, the appliqué work and metal-wire embroidery are some of the brilliant specimens of Indian embroidery. Appliqué or Pipli Work: Appliqué or Pipli Work is an integral part of the decorative needlework of Pipli village in Orissa and some parts of Gujarat. It is based on patchwork, in which pieces of coloured and patterned fabric is finely cut in different sizes and shapes and sewn together on a plain background to form a composite piece. They are found in brilliant colours and are highly ornamented with motifs, which include human forms, animals and vehicles. 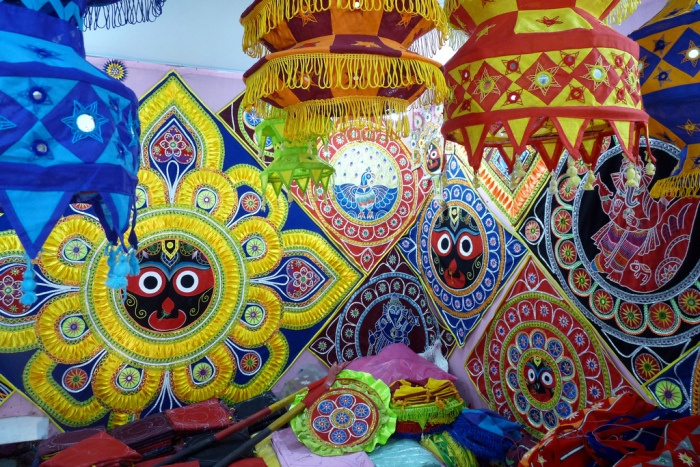 Originally parasols, canopies and pillows were made for the Rath Yatra but now many objects of daily use like lamp shades, garden umbrellas and bed covers have been introduced. Aribharat: The embroidery of Kutch is very picturesque and has the quality of jewellery. The best known is aribharat, which is named after ari, a hook, plied from the top but fed by silk thread from below with the material spread out on a frame. This movement creates loops, which are repeated to form a line of chain stitches. It is also known as Mochibharat, as it used to be done by mochis (cobblers). 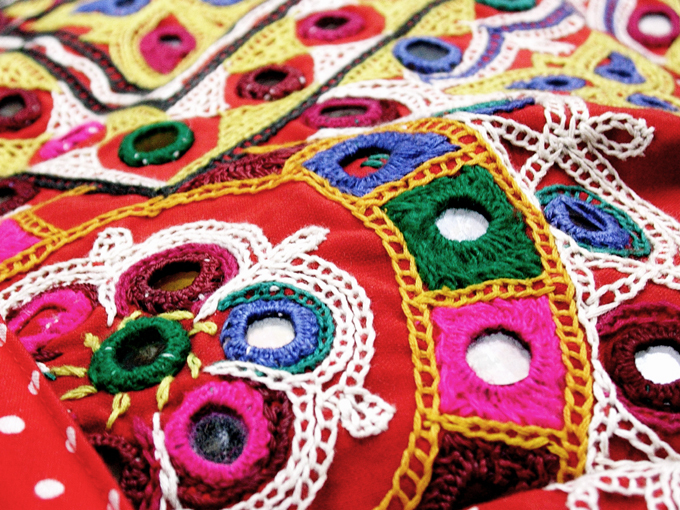 Banjara: The embroidery of the Lambada gypsy tribes of Andhra Pradesh, banjara is a mix of applique with mirrors and beadwork. 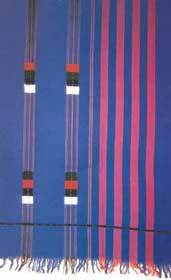 Bright red, yellow, black and white coloured cloth is laid in bands and joined with a white crisscross stitch. Chikankari: The Chikan work of Lucknow involves delicate and subtle embroidery done in white thread on varieties of cloth such as mulmul (fine cotton), voil or polyester.. It owes its origin to Nur Jehan. Intricate and complex, this work is similar to what is commonly known as shadow work. 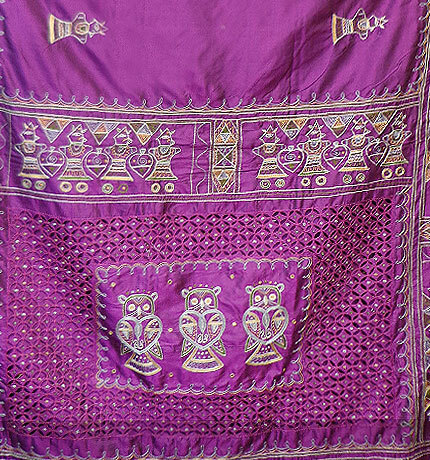 Simplicity, regularity and evenness of stitches, combined with very fine thread-knots are the highlights of Chikan work. 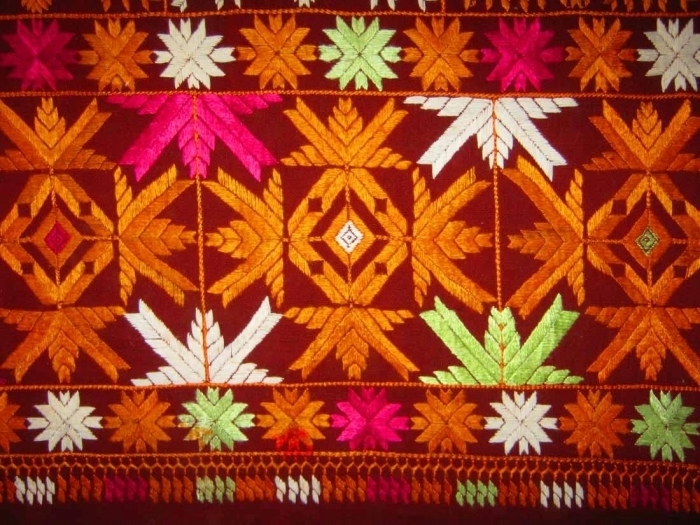 The different varieties of chikan stitches include tepchi, pechni, bakhia, zanjira, phanda and murri. The Chikan kurtas are very popular. Crewel: Kashmir is known for phirans (woollen kurtas) and namdahs (woollen rugs) with big floral embroidery in cheerful colours. Crewel embroidery is the same as chain stitch and is usually done with an awl (a small pointed tool for making holes) and is worked from underneath the fabric rather than above. Gota Work: The gold embroidery of Jaipur, known as gota-work, is an intricate form of appliqué with patterns of amazing richness, worked out in minute detail in fine gold thread. Small pieces of zari ribbon are applied onto the fabric with the edges sewn down to create elaborate patterns. 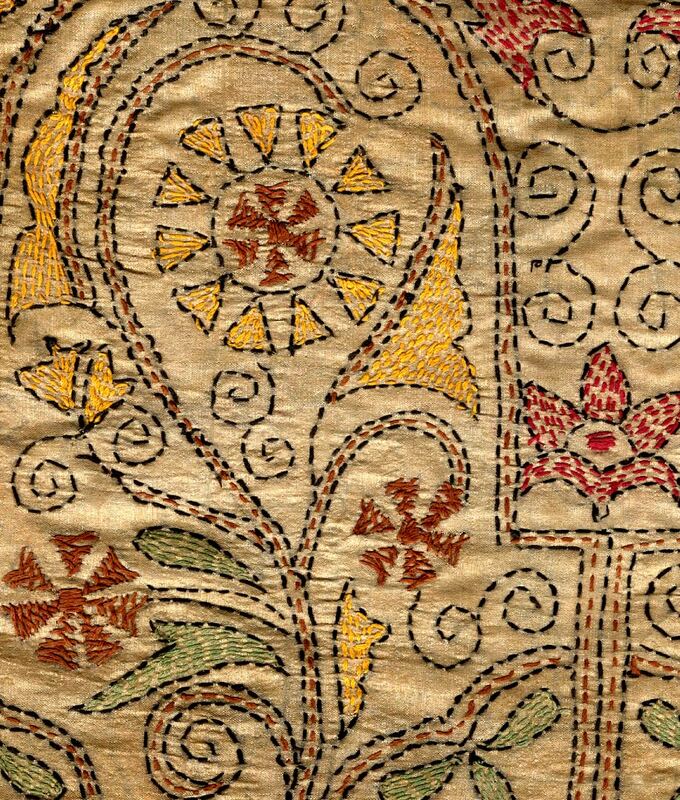 Lengths of wide, golden ribbons are similarly stitched on the edges of the fabric to create an effect of gold zari work. The gota method is commonly used for women’s formal costumes. Khandela in Shekhawati is best known for its manufacture. Kinari or edging refers to the art of fringed border decoration. It is usually practised by the Muslim craftsmen. Kantha: Kantha is a kind of patchwork embroidery, typical of Bihar and West Bengal, in which the ground consists of remnants of white cotton saris, while the threads used for the embroidery are picked from old materials. In kantha, the thread is carried over the surface in small stitches to produce a series of dotted lines. To these are added, from the reverse side, longer floats that are mostly used as decorative elements and for filling in the bodies of the figures. Floral, animal and bird motifs embroidered on both cotton and silk are extremely popular. 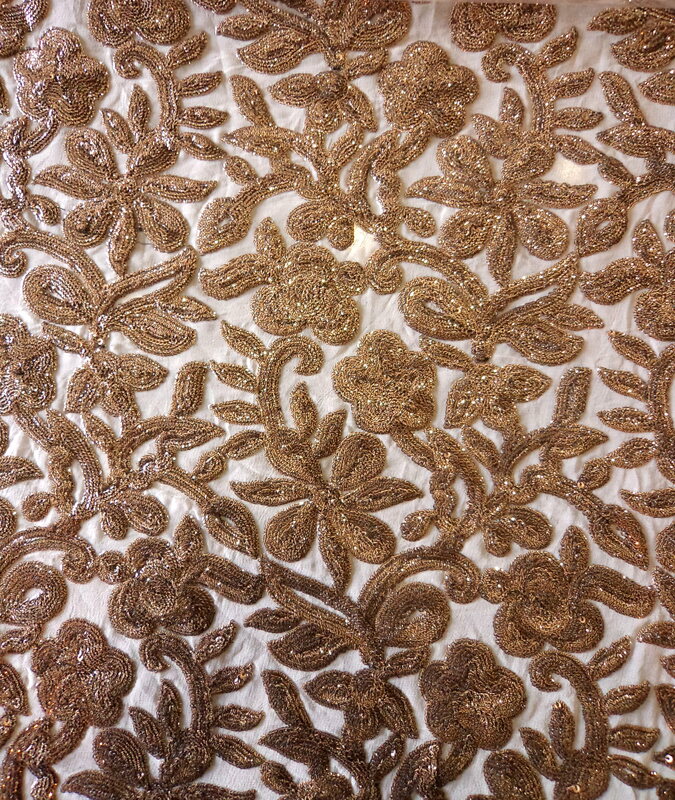 Karchobi: It is a form of raised zari metallic thread embroidery created by sewing flat stitches on cotton padding. 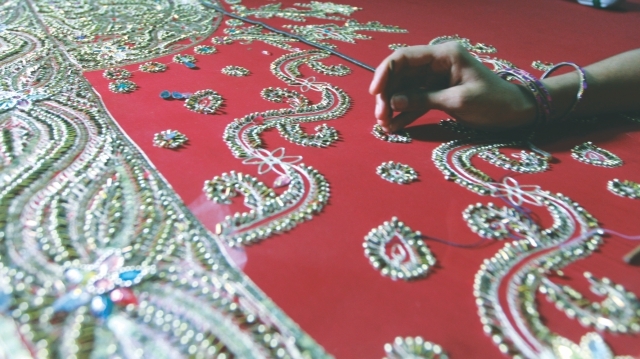 The technique is commonly used for bridal and formal costumes as well as for velvet coverings, tent hangings, curtains and the coverings of animal carts and temple chariots. 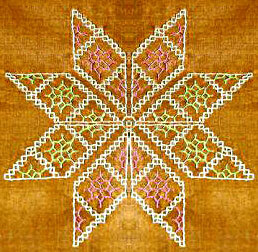 Kashida: This is the typical embroidery work of Bihar and is done in different styles. 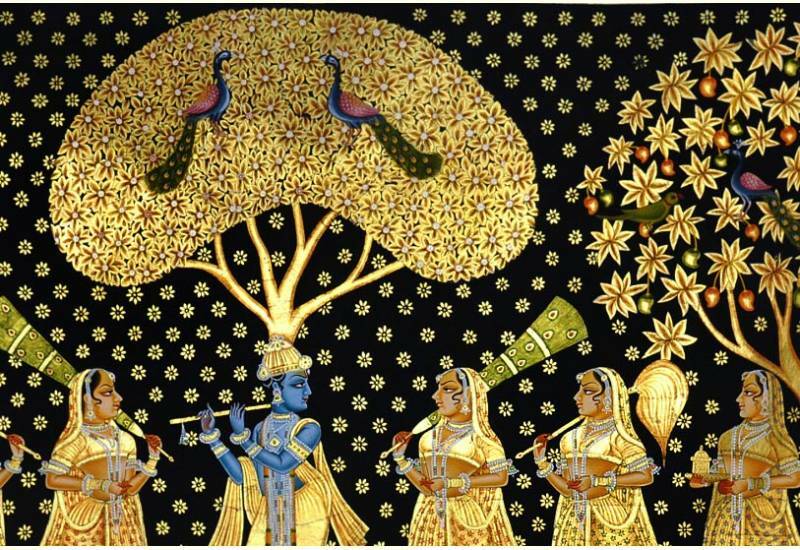 Kathi: This rural art of Gujarat is attributed to the nomadic tribes of the kathi. 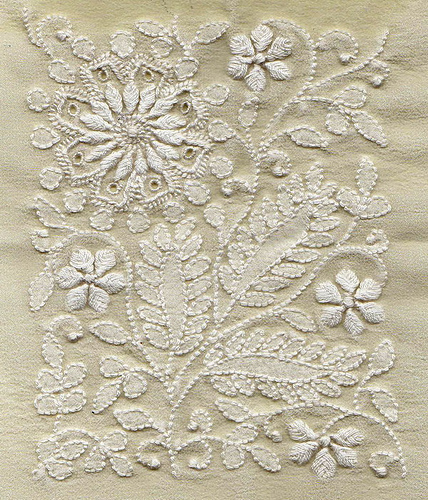 The work is distinguished by a very unusual technique in which chain stitch embroidery is combined with appliqué work and enhanced by small mirror-like insertions. 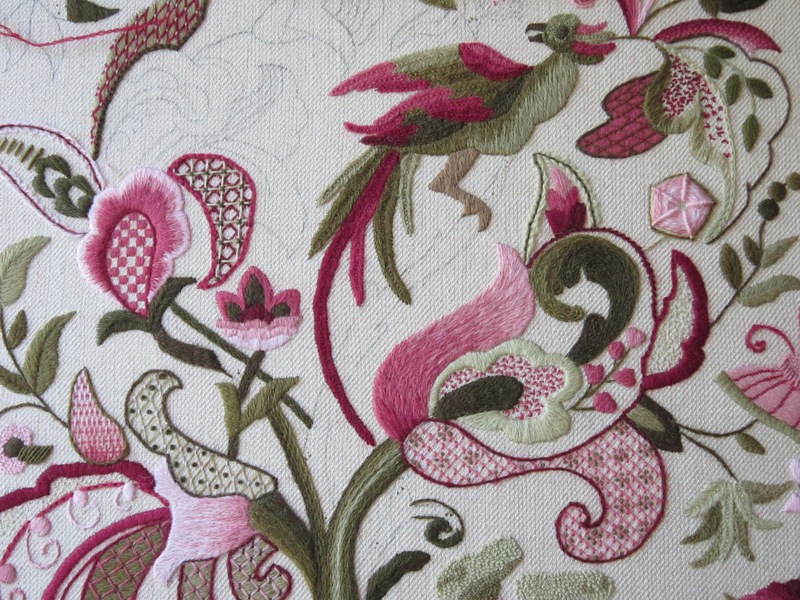 The embroidery is characterised in particular by its wealth of forms and motifs. 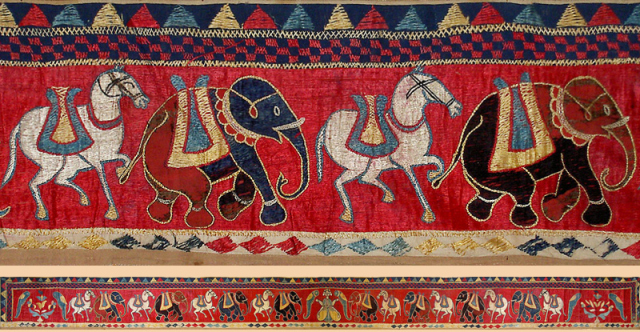 Many of the kathi embroideries depict Hindu themes. Mirror Work: The women of Rajasthan and Gujarat traditionally carry embroidered torans (frieze), dowry bags, shawls, cholis and dupattas as part of their dowry. This work can be identified by its use of tiny mirrors with colourful threads that shape floral and figurative designs. 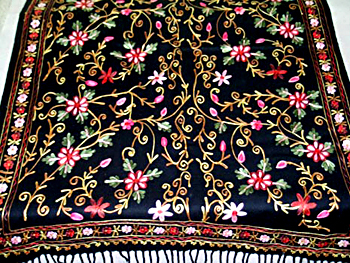 Patti Ka Kaam: It is the exquisite embroidery work of Aligarh in Uttar Pradesh. Phulkari: The Punjab phulkari is of a spectacular nature. The word means flowering and it creates a flowery surface. Strangely enough, the stitch itself is the simple darning like the damask, done either by counting the threads or with utmost care, since a single miss can spoil the whole pattern. Originally, the designs seem to have been predominantly geometrical but the phulkari now being produced for sale has often a lotus in the centre and stylised animals, birds, worked in harmoniously with flowers. The design is fed into the cloth from the reverse side using darning needles, one thread at a time, leaving a long stitch below to form the basic pattern. The stitching is done in a vertical and horizontal pattern as well as variations from this standard format, so that when the phulkari is finally complete the play of light on its shiny surface can do wonders. Stitching is usually done with silk thread, though occasionally cotton threads are also used. 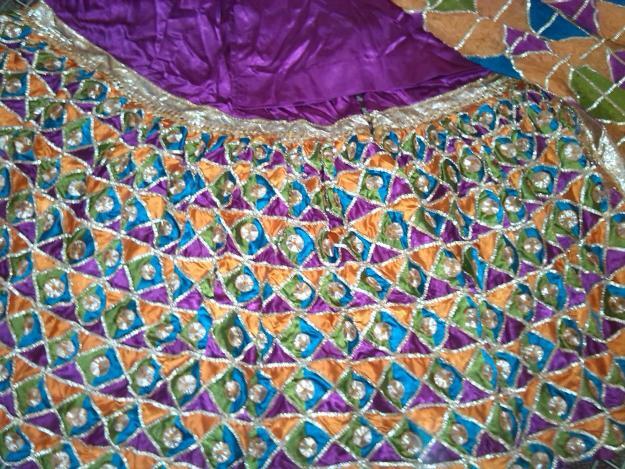 The best work in phulkari is found in Haryana in Gurgaon, Karnal, Hissar, Rohtak and Delhi. 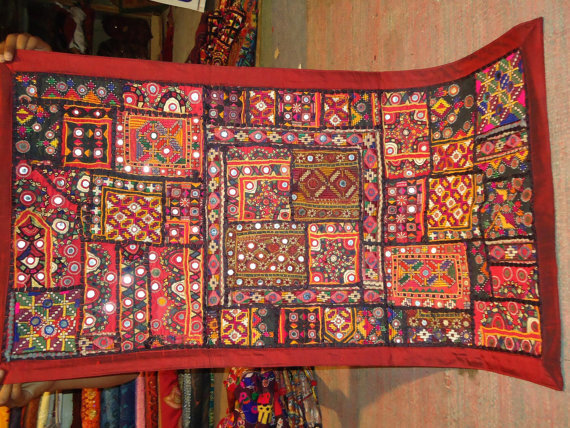 Pichwai: These are colourful embroidered cloth-hangings typical of Nathdwara in Rajasthan. 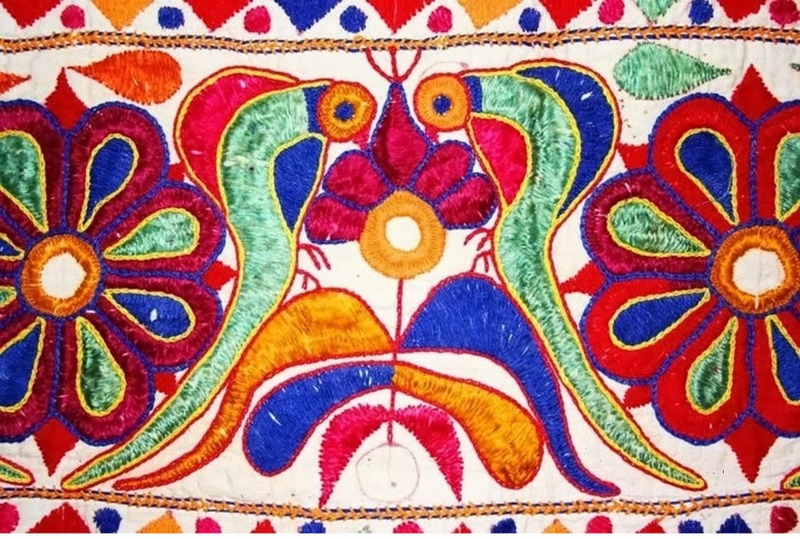 Rabari Art: This is a typical embroidery work of the nomadic Rabari tribes of the Kutch region. The embroidered motifs are generally camels, royal fans, elephants, scorpions and women bearing water. 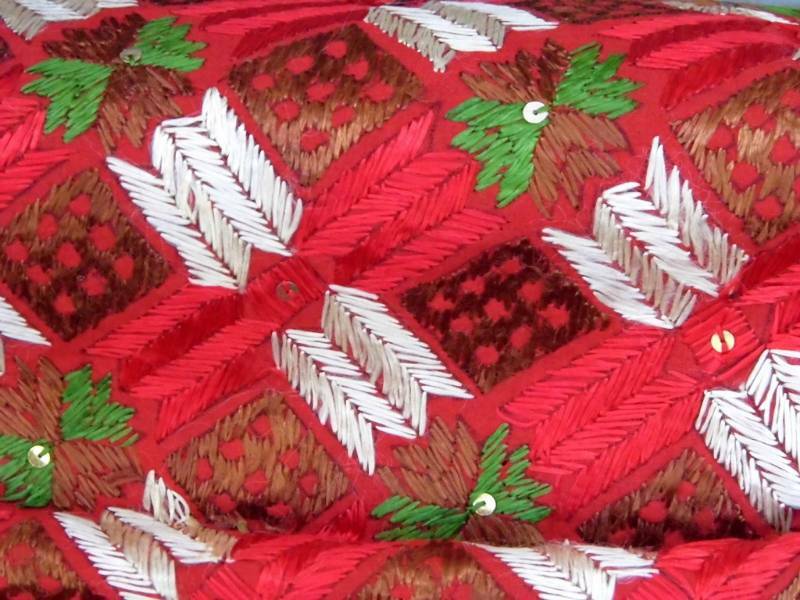 Shamilami: It is a combination of weaving and embroidery and was once a high status symbol in Manipur. 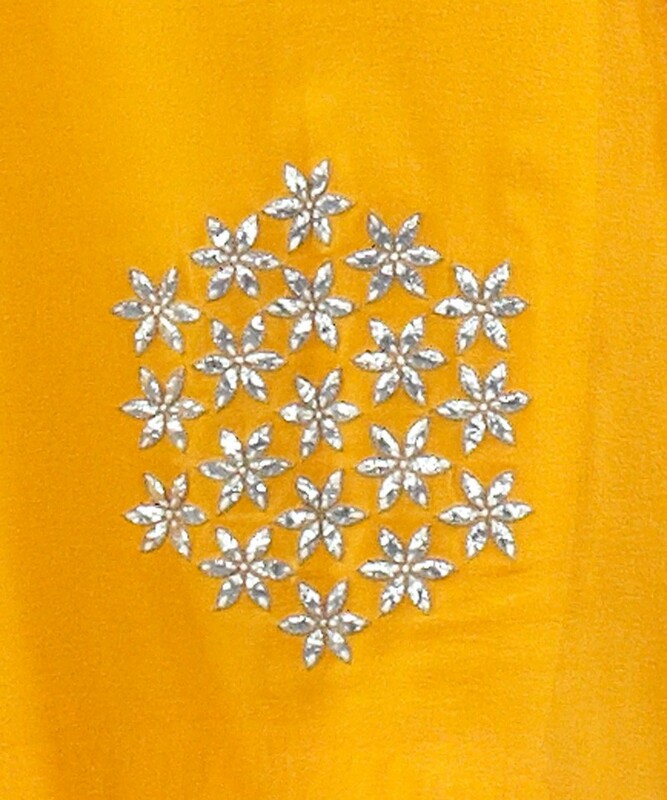 Zardozi or Zari: Zardozi or Zari or kalabattu is an embroidery work done in metal wires. Varanasi, Lucknow, Surat, Ajmer, Bhopal and Hyderabad are important centres for zari work. In this work, metal ingots are melted and pressed through perforated steel sheets to convert into wires. They are then hammered to the required thinness. Plain wire is called badla, and when wound round a thread, it is called kasav. Smaller spangles are called sitara and tiny dots made of badla are called mukaish. Zardozi, a more elaborate version of zari, involves the use of gold threads, spangles, beads, seed pearls, wire, gota and kinari. Next Hit the summer with new shades..